Discover Arlington Cemetery with a Veteran guide trained in military history. Observe the changing of the guard at the Tomb of the Unknowns. Visit each of the Kennedy graves. Discover Robert E. Lee's mansion upon the grounds and his wife's garden where the first burials took place. Discuss the beginning of the cemetery during the Civil War and its evolution through all of our nations conflicts. 0800: Pick up at lodging or agreed meeting point. 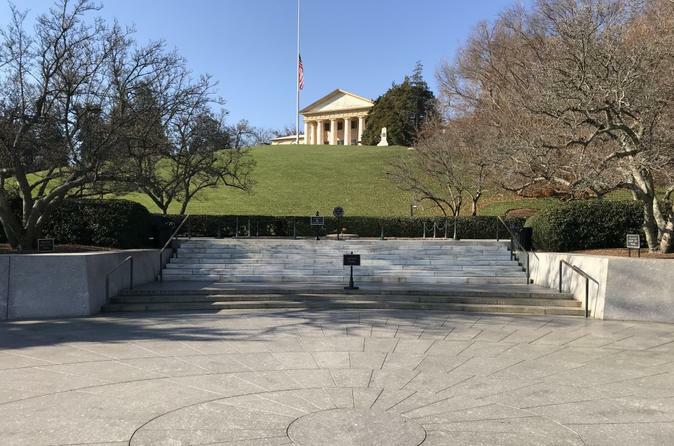 0820-1130: Arlington Cemetery Tour: Discover how the cemetery got its start and some not so well known history. Observe portions of a full military honors funeral. Experience Arlington with all five senses. Visit the grave of a favorite notable or loved one. Tour a not well traveled part of the cemetery and observe silence and serenity. 1130-1200: Transit to agreed drop off point. Meeting location: Agreed Location within Alexandria City Limits, Arlington County, or District of Columbia (Washington City). Most of the tour is out of doors so dress appropriately for the season. Early morning (0800 or 0830) start recommended. End location: Agreed Location within Alexandria City Limits, Arlington County, or District of Columbia (Washington City). Transportation Method: Private SUV (2017 Buick Enclave) to and from the cemetery. There's an option to employ the public trolley on the cemetery grounds if guests are mobility limited. We will see more if we tour afoot. Touring afoot is hilly and about 2.75 miles or 4.4 km.